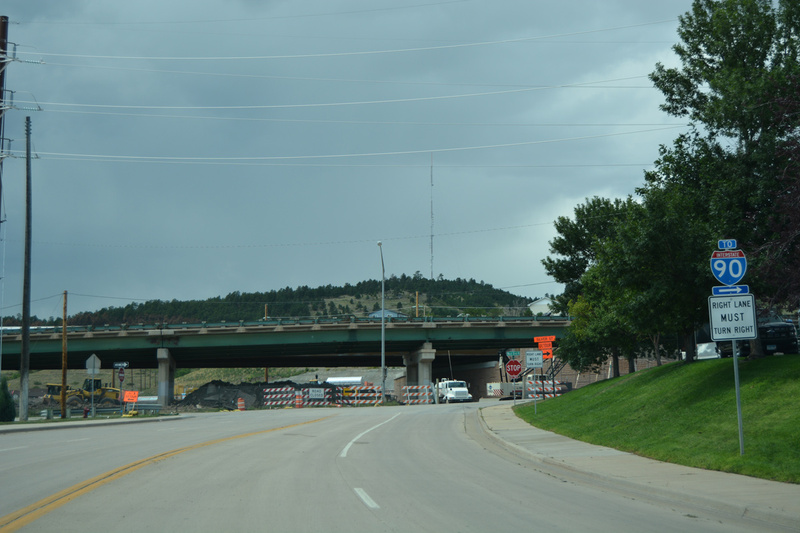 Running concurrent with U.S. 16, Interstate 190 is a short spur from Interstate 90 & U.S. 14 south into Downtown Rapid City. 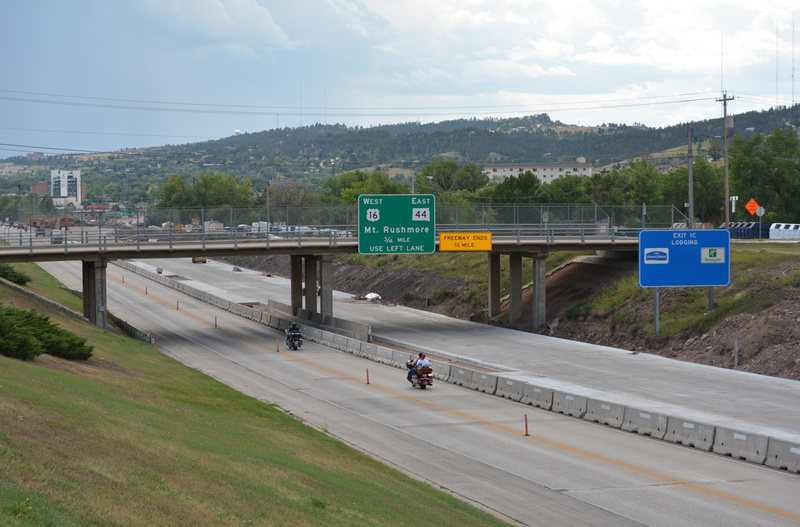 U.S. 16 ends its 500 plus mile route at the trumpet interchange with I-90 in north Rapid City. Prior to 2000, the northern terminus of I-190 was a multi-level directional T interchange. This exchange was reconfigured into a trumpet interchange, eliminating the left side ramps along I-90 westbound. I-190/Silver Street Interchange Project construction - Photos taken 08/12/16. West Boulevard north at SD 44 (Omaha Street) and the northbound beginning of Interstate 190. Photo taken 04/16/18. U.S. 16 turns north onto I-190 from Omaha Street westbound as the freeway quickly spans Rapid Creek ahead of Exit 1C with North Street. Photo taken 04/16/18. The exchange with North Street was rebuilt from a split diamond interchange into a single point urban interchange (SPUI). The I-190/Silver Street Interchange Project ran from August 2015 to October 2017. Photo taken 04/16/18. Passing over Silver Street, drivers pass by the first reassurance shield assembly for Interstate 190 north & U.S. 16 east. Nickle Street runs along side the four lane freeway as service roads to North Street. Photo taken 04/16/18. A second set of shields for I-190 north & U.S. 16 east stand beyond the Silver Street on-ramp. Photo taken 04/16/18. Northbound Interstate 190 at the Anamosa Street overpass. An on-ramp formerly connected with the freeway north of here. Photo taken 04/16/18. 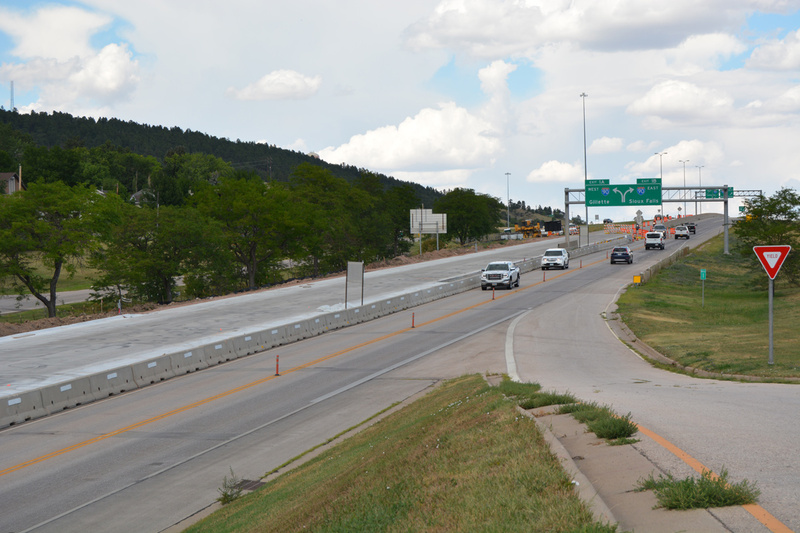 Single lane ramps depart next for I-90 & U.S. 14 west to Black Hawk and Gillette, Wyoming (Exit 1A) and I-90 & U.S. 14 east to Box Elder and Sioux Falls (Exit 1B). Photo taken 04/16/18. I-190 north and U.S. 16 east conclude as traffic partitions at Exits 1A/B. 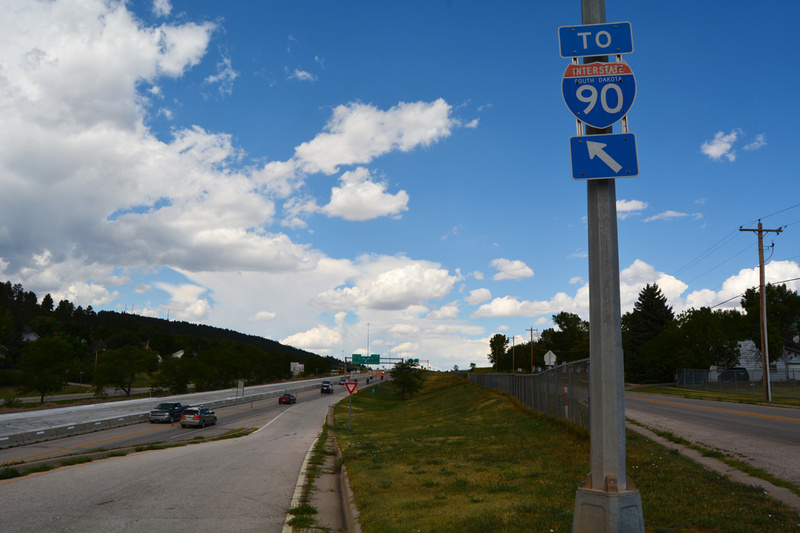 Interstate 90 travels northwest toward Sturgis, Deadwood and Spearfish. 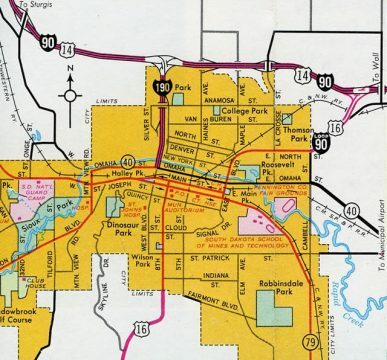 U.S. 14 remains along side I-90 east to Wall, with the freeway advancing from there to Chamberlain, Mitchell and Sioux Falls. Photo taken 04/16/18. I-190 south and U.S. 16 west begin and head south from the trumpet interchange with I-90 a half mile to the single point interchange (Exit 1C) with North Street. Photo taken 04/16/18. Reassurance shields for I-190 south & U.S. 16 precede the Anamosa Street overpass. Nickle Street parallels the freeway as a west side frontage road. Photo taken 04/16/18. Interstate 190 ends 0.75 miles beyond the Anamosa Street bridge at South Dakota 44 (Omaha Street) and West Boulevard south. Photo taken 04/16/18. Exit 1C departs the freeway southbound for North Street east to Rushmore Plaza Civic Center and west to Founders Park Drive and Executive Golf Course. Photo taken 04/16/18. Speed limits reduce to 45 miles per hour as a median replaces the concrete barrier separating the north and southbound roadways of I-190. Photo taken 04/16/18. Crossing over Rapid Creek, I-190 south approaches the signalized end with Omaha Street and West Boulevard. U.S. 16 dog legs east along side SD 44 two blocks to Mt. Rushmore Road south through Downtown Rapid City. 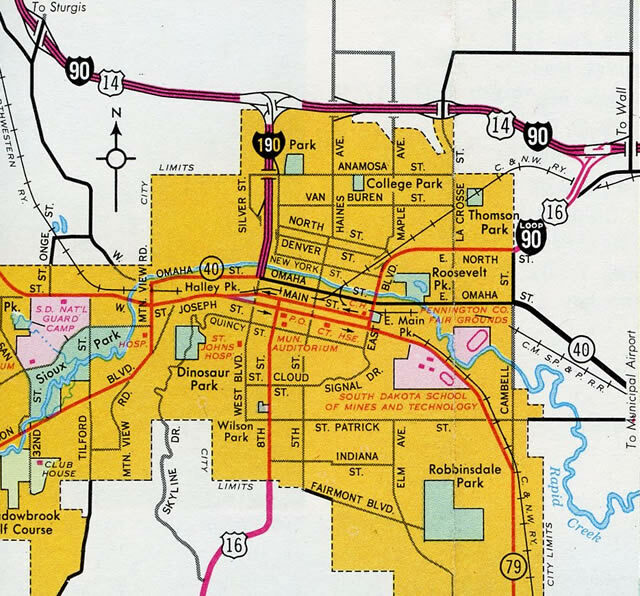 SD 44 passes north of the business district along Omaha Street west to Founders Park and to Roosevelt Park. Photo taken 04/16/18. West Boulevard extends south from the freeway end two blocks to the couplet of Business Loop I-90 (Main Street west / St. Joseph Street east). Photo taken 04/16/18. "Straightening of I-190 causes mountain of dirt by the roadside." Rapid City Journal (SD), October 27, 2015. September 2017 Newsletter, I-190/Silver Street Interchange Project.